Thanks for sharing this, so interesting. Our son was the drummer in our Civil War unit when our kids were younger. 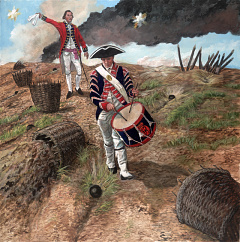 The drummer was such an important man… he gave out the orders via his drum to all the soldiers as he was give them by the commanders. Happy to hear that you and the drummer boy connected! He is more important than I imagined. There must have been many of them in the rev War. This one hit the spotlight. Merci beaucoup for reading my blog or history bite as I fondly call them. I have one ready to go for the 15 Nov.